In the current debate over Iraq, there is an elephant in the room that few are willing to acknowledge. While the U.S. military has performed superbly in Afghanistan, Iraq and elsewhere, our ground forces are under enormous strain. This strain, if not soon relieved, will have highly corrosive and potentially long-term effects on the force. by failing to adequately equip and protect the young Americans they sent into harm’s way. These failures have created a real risk of “breaking the force” – a force that is critical to protecting and advancing our national interests, now and in the future. The American military deserves better. The American people deserve better. This paper is intended to sound a warning – to raise awareness about the state of our ground forces today and the very real risk that poses to our future security. This paper also proposes an action plan for restoring the health and vitality of the U.S. military. The administration has under discussion some of what is recommended here, but the actions actually being taken fall far short of what is required. Nearly all of the available combat units in the U.S. Army, Army National Guard and Marine Corps have been used in current operations. Every available combat brigade from the active duty Army has already been to Afghanistan or Iraq at least once for a 12 month tour. Many are now in their second or third tours of duty. Approximately 95% the Army National Guard’s combat battalions and special operations units have been mobilized since 9/11. Short of full mobilization or a new Presidential declaration of national emergency, there is little available combat capacity remaining in the Army National Guard. All active duty Marine Corps units are being used on a “tight” rotation schedule – seven months deployed, less than a year home to reset, and then another seven months deployed – and all of its Reserve combat units have been mobilized. The Army is experiencing the beginnings of what could become a major recruiting crisis. At the end of FY2005, the active Army fell 6,627 recruits short of its annual goal of 80,000 new accessions. Although this shortfall is not alarming in and of itself, there are some important indicators that the recruiting shortfall will be far larger next year. In addition, some worry that the Army is lowering its quality standards, drawing a higher than normal percentage of its new recruits from “Category IV” (the lowest aptitude level accepted). This year will be critical in determining whether the active Army is simply going through a bad patch or entering one of the worst recruiting crises in its history. Meanwhile, the Army Reserve fell 16% behind its recruiting target for the year, and the Guard 20% short of its annual goal. The Army and Marine Corps are meeting their overall retention goals, for the moment, but some fear a major retention crisis may be looming for the Army. While the Army met its overall retention goals in 2005, the Army National Guard and Army Reserve fell short of their goals for those deciding whether to renew their commitment for the first time, creating the potential for long-term imbalances in the force. In addition, some of our most highly skilled people, like Special Operations Forces, are leaving the force to become more highly paid contractors. Furthermore, between 2001 and 2004, divorce rates and the incidence of domestic violence increased markedly, indicating the severity of the strains on Army personnel and their families. Some commanders fear that these seemingly unrelated developments could auger a retention crisis in the future. The Army and the Army National Guard have experienced critical equipment shortfalls that increased the level of risk to forces deployed in Iraq and Afghanistan and reduced the readiness of units in the United States. From the beginning of the Iraq war until as late as last year, the active Army experienced shortages of key equipment for deployed troops. While many of these shortfalls have been addressed, the readiness ratings of many non-deployed units, including some slated to deploy later this year, have dropped to very low levels. This situation is even worse for Army National Guard units. These readiness shortfalls are only likely to grow as the war in Iraq continues to accelerate the wearout rate of all categories of equipment for the ground forces. The Army and the Marine Corps cannot sustain today’s operational tempo indefinitely without doing real damage to their forces. If recruiting trends do not improve over the next year, the Army, both active and reserve, will experience great difficulty fully manning its planned force structure and providing the needed rotation base for operations in Iraq and Afghanistan. Fewer than needed recruits and first-term reenlistees could result in a significant “hollowing” and imbalance in the Army. There is already a deficit of some 18,000 personnel in the Army’s junior enlisted grades. Even if it meets its recruiting and retention goals, the Army is expected to be short some 30K soldiers (not including stop loss) by the end of FY06. This will undermine unit readiness, exacerbate PERSTEMPO strains, and jeopardize the Army’s ability to populate its planned force structure. These factors will create tremendous internal pressures to begin drawing down the level of Army forces in Iraq by next spring, whatever the conditions on the ground may be. If retention rates decline significantly, the viability of the All Volunteer force could be threatened. The All Volunteer Force is now in historically uncharted waters: fighting a protracted conflict with volunteers rather than draftees. The conventional wisdom is that while most will stay in the force after one or even two tours, there is a real concern that a third deployment in a compressed time period may cause many to choose to leave the force. In the meantime, the United States has only limited ground force capability ready to respond to other contingencies. The absence of a credible strategic reserve in our ground forces increases the risk that potential adversaries will be tempted to challenge the United States. Although the United States can still deploy air, naval, and other more specialized assets to deter or respond to aggression, the visible overextension of our ground forces could weaken our ability to deter aggression. Resetting, recapitalizing and modernizing our nation’s ground forces will be no small challenge and will require substantial and sustained investment. Severe wear and tear on Army, Marine Corps and Guard equipment is increasing the costs of “resetting” the force as units return home. In addition, the costs associated with recapitalizing aging forces and transforming for new missions are only increasing. 1. Fully fund the recovery and transformation of our nation’s ground forces. In order to restore the health of U.S. ground forces in the wake of Iraq, we must invest substantial resources to reset, recapitalize, and modernize the force. Resetting the force is underway and has been funded through emergency supplemental appropriations. But anticipated equipment rehabilitation costs may extend beyond the supplemental appropriations for Iraq and Afghanistan, which could leave both the Army and the Marine Corps with big unpaid bills. Congress must ensure that even when supplemental funding ends, adequate funding for resetting the force continues. Without this, neither service will be able to “get well” in the wake of Iraq. In addition, both the Army and the Marine Corps have systems that are nearing the end of their projected service lives. Soon they will need to embark on major recapitalization programs to keep their forces supplied with reliable, functioning equipment. Further, both the Army and the Marine Corps have ambitious plans to modernize and transform their forces to execute 21st century missions. 2. Adapt the roles, missions, organization, training and equipment of the National Guard and Reserves for the future. Since the end of the Cold War, and especially in the aftermath of 9/11, the National Guard and Reserves have evolved from being a strategic reserve – forces to be mobilized for a major war or national emergency -- to an operational reserve – forces that regularly support the operations of the active duty military at home and abroad. The reality is that the operational reserve model is here to stay. Demand for U.S. military forces is likely to remain high (even if not as high as today) and budget, demographic and recruiting realities will preclude a major expansion of the active duty military in the near term. But this new reality is not reflected in how reserve forces are being organized, trained, equipped, and funded. Consequently, we have a legacy force making heroic efforts to perform a new set of missions at an unsustainable tempo of operations and without the necessary resources, training and equipment. We need a new social compact between the U.S. government and our “citizen soldiers” that clarifies both the new expectations of a more operational reserve and the government’s obligations to those who are serving under this new construct. We must preserve this essential link between the military and the body politic – to ensure that any President is able to mobilize substantial numbers of America’s citizen soldiers when necessary. Given that future demand is like to span a broad range of missions – from high-intensity combat operations and stability and reconstruction operations to counterterrorism and homeland defense – we need to prepare and resource reserve forces that are capable of conducting a wide variety of operations. In particular, homeland defense and civil support are becoming increasingly important missions for the National Guard, and that should be reflected in how some units of the Guard are equipped and trained. 3. Increase the pool of deployable forces in the Army over time by at least 30,000 personnel. Looking to the future, demand for U.S. ground forces will most likely remain higher than pre-9/11 levels. We should make permanent the 30,000 person increase in active duty Army end strength that the Congress has authorized but that the Secretary of Defense views as only a temporary measure. Making this increase permanent would enable the Army to grow its active duty force structure to at least 48 brigade combat teams (rather than just 42) over time. While increasing the size of the Army would make it easier to meet future operational requirements, it will certainly not be easy. In the near term, recruiting additional soldiers will be difficult, if not impossible – at least until we turn the corner in Iraq. Building additional force structure will take time, both to establish new units and to populate them with trained personnel. Increasing force structure will also be expensive – about $1.5 billion for each new brigade plus recurring personnel costs. 4. Rebalance the mix of U.S. military capabilities for 21st century missions. First, the U.S. military must convert units that are in low demand in the new security environment into unit types that are in high demand in order to reduce the most acute strains on the force. That is already underway, but should be accelerated. Second, we need to rebalance the mix of capabilities in the active and reserve components and create more stable and predictable schedules for deployment. Third, we need to take maximum advantage of technology and services offered by the private sector to make the best use of our military personnel. In today’s military, incorporating the latest information technology and “working smarter” can substantially reduce manpower requirements. More broadly, the U.S. government needs to build deployable operational capacity in key civilian agencies like the State Department to conduct critical tasks for which the U.S. military does not have a comparative advantage. The U.S. also needs to encourage the development of greater international capacity to conduct complex missions like stabilization and reconstruction. 5. Increase support for recruiting and retention efforts. Although President Bush has sent the U.S. military to war in Iraq and to fight terrorism around the globe, he has failed to mobilize the American people for either cause. There has been no JFK-like “ask not what your country can do for you, but what you can do for your country” speech – no call to national service. This failure of leadership has only widened the gap between U.S. military personnel and the American people they are risking their lives to protect and contributes to the recruiting crisis. Congress should continue to give the military services the flexibility they need to tailor and target recruiting and retention incentives to be as effective as possible. The 2006 National Defense Authorization Act includes a wide variety of incentives, from higher cash bonuses to education benefits to down payment assistance for first homes to referral bonuses for serving soldiers who bring in new recruits. Additionally, we should offer a broader range of options to young Americans who are interested in serving their country. It should be easier for people to transition back and forth between active duty service and the Guard or reserves, easier for “middle aged” Americans to join the military, easier for those who leave the military to come back into service, and easier to bring civilians with critical skill sets into some form of voluntary national service. The strains on the U.S. Army and Marine Corps are serious and growing, and the viability of our All Volunteer Force is at risk. To guarantee U.S. national security, we must keep faith with the men and women in our military and with the American people. We need to act now to protect and restore our armed forces. Today, in operations from Iraq and Afghanistan to southeast Asia and the Balkans, the men and women of the U.S. military have performed superbly and sacrificed greatly to protect and advance U.S. national security interests. In the post-Cold War, post-9/11 era, the United States needs a strong military that is second to none. The U.S. armed forces must be able to conduct a broad range of missions abroad and, as Hurricane Katrina reminded us, here at home. Our armed forces must be able to defend the U.S. homeland; deter and, if necessary, defeat aggression against U.S. allies and interests around the world; help to establish and maintain stability in key regions; destroy terrorist organizations, deny them safe haven, and fight insurgencies; counter the proliferation of weapons of mass destruction to both state and non-state actors; work with the militaries of other countries, and with multilateral and international organizations, to build their capacities for these missions; and help respond to disasters, both manmade and natural, here at home. Fielding such a military depends in large part on our nation’s ability to attract the best and brightest Americans to military service. Since the mid-1980s, the U.S. military has been able to recruit and retain a professional force of high quality volunteers. Indeed, the quality of the people in the force – both active duty and reserve – has been the foundation on which the United States has been able to build the best military in the world. These failures have created a real risk of breaking parts of the force – a force that is critical to protecting and advancing our national interests, now and in the future. The American military deserves better. The American people deserve better. This paper is intended to sound a warning – to raise awareness about the state of our ground forces today and the very real risk that poses to our future security.2 Breaking our ground forces would put this nation’s security in grave danger. We cannot allow this to happen. Therefore, this paper proposes an action plan for restoring the health and vitality of the U.S. military. The administration has under discussion some of what is recommended here, but the actions actually being taken fall far short of what is required. Right now, in Afghanistan, Iraq, and around the globe, the U.S. military is fighting for us. Today, we are standing up to fight for them. Nearly all of the available combat units in the U.S. Army, Army National Guard and Marine Corps have been used in current operations. In the reserve component, more than 95% of the Army National Guard’s combat battalions and all but one of its 10 special operations units have been mobilized since 9/11. This includes units that have been deployed to Operation Enduring Freedom or Operation Iraqi Freedom as well as units supporting operations in the Balkans. Short of full mobilization, there is little or no combat capacity remaining in the Army National Guard that could be available for deployment, without the President declaring a new emergency, given the statutory constraint that individuals cannot be mobilized for more than 24 consecutive months.6 At the same time, the average length of tour for reservists has more than doubled, from 156 days in Desert Shield/Desert Storm to 342 days in OEIF/OIF. In addition, 60% of the Army Reserve, comprised primarily of support units, has been mobilized since 9/11. Only 16% of the Army Reserve remains eligible for mobilization to support operations in Iraq and Afghanistan under current authorities, but many of the remaining specialties are not in demand. Fielding the necessary combat support/combat service support units has proven particularly challenging for the Army. In the current rotation in Iraq, 20% of these units are being manned with soldiers that were removed from their original occupational specialties and rapidly retrained to fill empty billets in cobbled-together units. The Marine Corps is also under tremendous strain. All active duty Marine Corps units are being used on a “tight” rotation schedule of seven months deployed, less than a year home to reset, and then another seven months deployed – meaning that active duty Marine Expeditionary Units (MEUs) are experiencing two operational deployments per cycle rather than the usual one per cycle. In addition, all of the Marine Corps Reserve’s combat units have been mobilized. The Army may be experiencing the beginnings of a recruiting crisis. The active duty Army began missing its recruiting goals in February 2005, when it fell short of its monthly goal (by 27%) for the first time since 2000. At the end of FY2005, the Army fell 6,627 recruits short of its annual goal of 80,000 new accessions for the active duty force.7 Although this shortfall is not alarming in and of itself, many expect the recruiting shortfall to be far larger this year if public support for the war in Iraq continues to decline, the demographic of young Americans eligible to serve continues to shrink,8 the economy continues to offer more attractive alternatives to young job seekers, and the propensity of young Americans to enlist continues to decrease. In addition, some worry that the Army is lowering its quality standards: in October 2005, for example, 19% of Army recruits were drawn from “Category IV” (the lowest aptitude level accepted) – a percentage far higher than the historical average. The coming year will be critical in determining whether the active Army is simply going through a bad patch or entering one of the worst recruiting crises in its history. The Army Reserve fell about 16% behind its recruiting target for the year, and the Guard about 20% short of its annual goal. Of particular concern is the downward trend in Army Reserve end strength for FY2005-06. Current authorized and budgeted end strength is 205K, but actual end strength is only about 190K. The Army Reserve now projects increased losses of personnel, which will make achieving its FY2006 end strength target extremely difficult. Although Army National Guard end strength is now 10K short of its authorized level of 350K, in the past few months increased recruiting and retention efforts have begun to narrow this gap. Part of the problem here is that people leaving the active duty military are no longer signing up for the Guard and Reserves in the numbers that they have in the past. Some are being prevented from leaving the active Army by “stop loss” orders. Others are choosing to stay in the active force. Still others, once they get out, do not want to risk being deployed again as a reservist. As a result, the Army Guard and Reserves have fewer “prior service” personnel and are now in direct competition with the active Army for new recruits. The Army and Marine Corps are meeting their overall retention and attrition goals, for the moment, but some fear that a retention crisis may be looming for the Army. So has the practice of amalgamating retention rates for different parts of the force into a single figure. For example, while the Army Reserve and Army National Guard exceeded their retention goals for careerists, they fell substantially short of their goals for those deciding whether to renew their commitment for the first time, creating the potential for long-term imbalances in the force. In addition, we are having trouble keeping some of our most highly skilled people in the force. The Bush administration’s decision to use large numbers of private contractors on the battlefield in Iraq has had the perverse effect of incentivizing highly trained Special Operations Forces personnel to leave the armed forces in order to work as contractors for much higher pay. Unfortunately, other indicators suggest a major retention crisis may be on the horizon. Between 2001 and 2004, divorce rates among active duty Army officers tripled, and rates among Army enlisted soldiers grew by 50% as deployments lengthened and increased in frequency. Although these divorce rates have begun to decline in the past year, they underscore the severity of the strains on active duty personnel and their families. Similarly, the incidence of domestic violence increased over the same period. These and other warning signs have caused some commanders to fear that personnel who were willing to undertake successive deployments as part of a “surge” may not be willing to sustain this tempo of operations over the long term due to the adverse impacts on their families. The Army and the Army National Guard have experienced critical equipment shortfalls that increased the level of risk to forces deployed in Iraq and Afghanistan and reduced the readiness of units in the United States. From the beginning of the Iraq war until as late as last year, the active Army experienced shortages of key equipment items – such as radios, up-armored HMMWVs, trucks, machine guns, rifles, grenade launchers, and night vision equipment – for troops deploying overseas. While many of these shortfalls have now been addressed for deployed units, the readiness ratings of many non-deployed units – based on their manning, equipment, and training levels – have dropped to very low levels (C-3 or C-4).10 This is particularly worrisome in light of the fact that some of these units are slated to deploy later this year. This situation is even worse for Army National Guard units, many of whom have had to leave their equipment sets in Iraq for arriving units to fall in on. These readiness shortfalls are only likely to grow as the war in Iraq continues to accelerate the wearout rate of all categories of equipment for the ground forces. The Army and the Marine Corps cannot sustain today’s operational tempo indefinitely without doing damage to their forces. Today’s tempo of operations is well above what the Army believes it can manage over the long term. Army personnel management policies generally aim for at least two years at home between deployments for active duty personnel and mobilization no more than once every five to six years for Guard and reserve personnel. This is the tempo that the Army believes it can sustain for long periods of time without losing personnel. But the Army cannot sustain its current deployment levels beyond 2006 without either sending active duty forces back to Iraq with less than two years’ rest, re-mobilizing reservists, or building additional new brigades. At the moment, none of these options appears viable. Similarly, the Marine Corps can temporarily surge to two deployments per three-year rotation cycle, but it cannot sustain this tempo indefinitely. When personnel are deployed for long tours with great frequency, it becomes exceedingly difficult to recruit high quality volunteers into the force and to keep the best quality personnel from leaving the force. If recruiting trends do not improve over the next year, the Army – both active and reserve – will experience great difficulty fully manning its planned force structure and providing the needed rotation base for operations in Iraq and Afghanistan. A year from now, the combination of fewer than needed recruits and fewer than needed reenlistments in the junior grades could result in a significant “hollowing” and imbalance in the Army, both active and reserve. Based on DoD’s monthly manpower report by grade, the Army already has a deficit of some 18,000 personnel in its junior enlisted grades (E1-E4). Even if it meets its recruiting and retention goals, the Army is projected to be short some 30,000 soldiers (not including stop loss) by the end of FY2006.11 Such a shortfall would force the Army to cannibalize some units in order to fully man others to deploy. This would negatively impact not only the cohesion of the units deploying but also the readiness and usability of those left at home. It would also exacerbate strains on personnel pulled from recently returned units and reassigned to fill out deploying ones. Such manpower shortfalls will also jeopardize aspects of the Army’s plan to transform its division-based structure into modular brigade combat teams – the Army may simply not have enough people to populate its planned force structure. These factors will create tremendous internal pressures to redeploy additional U.S. forces from Iraq by next spring, whatever the conditions on the ground may be. If retention rates decline significantly, the viability of the All Volunteer force could be threatened. Many observers of the Army and Marine Corps are now waiting for the other shoe – the retention shoe – to drop. The All Volunteer Force is now in historically uncharted waters: fighting a protracted conflict with volunteers rather than draftees. What will happen if the current surge for Iraq becomes the steady state and the Army and Marines are not resourced with the people, units and equipment they need for a long-term fight? When will the dedication and sacrifice of our troops run up against the needs of families and communities? Will they vote with their feet? If they do, what will become of the All Volunteer Force? The conventional wisdom is that while most will stay in the force after one or even two tours, after a third year-long deployment in a compressed time period, many will choose to leave the force. Many senior military officers who lived through the Vietnam era and its aftermath believe that if significant numbers of senior noncommissioned officers and field grade commanders begin to leave the force, this could set off a mass exodus and lead to a “hollowing out” of the Army. In the meantime, the United States has only limited ground force capability ready to respond to other contingencies. The absence of a credible strategic reserve in our ground forces increases the risk that potential adversaries will be tempted to challenge the United States. Since the end of World War II, a core element of U.S. strategy has been maintaining a military capable of deterring and, if necessary, defeating aggression in more than one theater at a time. As a global power with global interests, the United States must be able to deal with challenges to its interests in multiple regions of the world simultaneously. Today, however, the United States has only limited ground force capability ready to respond outside the Afghan and Iraqi theaters of operations. If the Army were ordered to send significant forces to another crisis today, its only option would be to deploy units at readiness levels far below what operational plans would require – increasing the risk to the men and women being sent into harm’s way and to the success of the mission. As stated rather blandly in one DoD presentation, the Army “continues to accept risk” in its ability to respond to crises on the Korean Peninsula and elsewhere. Although the United States can still deploy air, naval, and other more specialized assets to deter or respond to aggression, the visible overextension of our ground forces has the potential to significantly weaken our ability to deter and respond to some contingencies. Resetting, recapitalizing and modernizing our nation’s ground forces will be no small challenge and will require substantial and sustained investment. Severe wear and tear on Army and Marine Corps equipment is increasing the costs of “resetting” the force as units return home. Resetting the force involves rehabilitating and repairing equipment returning from the field so that it can once again meet mission performance standards. Given the harsh environments of Iraq and Afghanistan, this is proving more extensive and expensive than in previous operations. Estimates of the costs of rehabilitating Army equipment coming back from operations overseas continue to grow, and are now expected to be some $40 billion over the next four years. In addition, both the Army and the Marine Corps expect to see increasing costs associated with recapitalizing aging forces and transforming their capabilities for a broader range of 21st century missions.12 Moreover, as the active Army’s force structure expands from 33 brigades to 42 brigade combat teams under its revised modularity plan, its equipment requirements will increase substantially. It will also need substantial funding to modernize its forces with the Army’s Future Combat System. Finally, the equipment requirements associated with enabling the Army National Guard and Army Reserve to serve as a truly “operational reserve” – available as a rotation base to support the active Army on a regular basis – are not yet fully understood, but are expected to be quite large. All this adds up to the need for major investments in the recovery and modernization of our nation’s ground forces. In the meantime, DoD should make maximum use of other strategies to reduce the demands on U.S. ground forces. For example, support units from the Air Force and Navy, which are not overextended, should be substituted for strained Army units to the greatest extent possible. In the current OIF rotation, about 9% of the combat support/combat service support units are being manned by personnel from other services. This practice should be expanded to the greatest extent possible in the coming months. In addition, the Bush administration should pursue a serious effort to rebuild consensus among allies and partners on a way ahead that leads to greater burden sharing and increased troop contributions from allies and partners. While this may be very difficult in Iraq, increased allied contributions to operations in Afghanistan could nevertheless help reduce the strains on U.S. ground forces overall. Finally, the administration should do everything in its power to enhance and accelerate the equipping and training of indigenous Iraqi and Afghan security forces. Several years into these supposedly high priority training efforts, there are still reports of indigenous forces lacking basic military equipment, adequate training facilities and essential operating infrastructure. There is simply no excuse for these shortfalls given the importance of the training mission to the success of these operations and ultimately to our ability to bring American troops home. 3. Increase the deployable capacity of the Army over time by at least 30,000 personnel. 4. Rebalance the mix of capabilities within the U.S. military for 21st century missions. 5. Enhance support for recruiting and retention efforts. In order to restore the health of U.S. ground forces in the wake of Iraq, the nation must step up and invest substantial resources to reset, recapitalize, and modernize the force. Resetting the force is already well underway in both the Army and the Marine Corps and has been funded through emergency supplemental appropriations. The problem is that anticipated equipment rehabilitation costs may well extend beyond the supplemental appropriations for Iraq and Afghanistan, which could leave both the Army and the Marine Corps with substantial unpaid bills. Congress must ensure that even when supplemental funding ends, adequate funding for resetting the force continues. Without this, neither service will be able to “get well” in the wake of Iraq. At the same time, both the Army and the Marine Corps have a number of systems that are nearing the end of their projected service lives. Both, for example, are faced with the prospect of block obsolescence for whole classes of vehicles. Within the next couple of years, the Army and the Marine Corps will need to embark on major recapitalization programs to keep their forces supplied with reliable, functioning equipment. This will be particularly challenging for the Army as it transitions to a force of more numerous modular brigade combat teams. In addition, both the Army and the Marine Corps have ambitious plans to modernize and transform their forces to be more capable of executing 21st century missions, and in both cases these plans are vulnerable to cost growth and to being underfunded over time. Restoring the health of both services is not a matter of simply returning them to their status quo ante; it is a matter of ensuring that they are organized, trained, equipped and resourced to meet the full range of traditional and non-traditional challenges in the future. Since the end of the Cold War, the National Guard and Reserves have gradually evolved from being a strategic reserve – forces to be mobilized for a major war or national emergency – to an operational reserve – forces that regularly support and provide a rotation base for the operations of the active duty military at home and abroad. This is especially true since 9/11. The reality is that the operational reserve model is here to stay. Demand for U.S. military forces is likely to remain high (even if not as high as today) and budget, demographic and recruiting realities will preclude a major expansion of the active duty military in the near term. But this new reality is not yet reflected in how reserve forces are being organized, trained, equipped, and funded. Consequently, we have a legacy force making heroic efforts to perform a new set of missions at an unsustainable tempo of operations and without the necessary resources, training and equipment. Given that future demand is likely to span a broad range of missions – from high intensity combat operations and stability and reconstruction operations to counterterrorism and homeland defense – we need to prepare and resource reserve forces that are capable of conducting a wide variety of operations. In particular, homeland defense is becoming an increasingly important mission for the National Guard, and that should be reflected in how some units of the Guard are equipped and trained. Given its history, deep ties to local communities and geographic dispersal across the United States, the National Guard remains the force of choice to undertake critical homeland defense missions and to provide military support to civil authorities. The National Guard is ideally suited for steady state missions at home like air defense as well as domestic crisis response missions like consequence management and WMD incident response. The Department of Defense needs to better define the roles and missions of the National Guard in homeland defense and civil support, and the Guard needs to conduct an in-depth assessment of how its organization, training, equipment and force management approaches need to change to meet the associated requirements. Particular attention should be paid to enhancing the National Guard’s training and equipment for conducting civil support and consequence management missions. Both the National Guard and the Reserves also have key roles to play in supporting U.S. military operations overseas, be it providing key capabilities or serving as a rotation base for long-lasting missions. This is particularly true for stabilization and reconstruction operations, where their civilian skills may be of great value. The reserves continue to offer a cost-effective way to rapidly expand the pool of available military forces in crisis or war, and sustain critical links between the U.S. military and the American people. To date, however, the National Guard and Reserves have not been adequately prepared or resourced for these indispensable roles. This nation needs to invest more in the readiness of the Army Reserve and National Guard. The costs of doing so have been estimated to be about $20 billion each for the Army National Guard and the Army Reserve. We also need to explore diversifying the contracts available to reservists to ensure that the U.S. military – and the U.S. government more broadly – can gain greater access to civilians with critical skills (e.g. information technology specialists, linguists, etc.) and that more Americans can serve their country in some capacity. Looking to the future, the demand for U.S. ground forces is unlikely to remain as high as it is today, but it is likely to remain higher than pre-9/11 levels given the range of security challenges we now face. The struggle against the threat from violent extremists will likely last for years, if not decades. Although this will require the integrated use of all instruments of U.S. national power, fighting terrorists abroad and protecting Americans at home will remain enduring missions for the U.S. military. Given that there is now a clear connection between failed or failing states and terrorists with global reach, the U.S. military will also be called on to conduct operations to deny terrorists safe haven and prevent ungoverned spaces from emerging. This will likely involve greater U.S. military assistance to build the capacity of other militaries and perhaps counterinsurgency operations to shore up friendly but weak governments. The U.S. military will also be tasked with combating the proliferation of weapons of mass destruction in various ways, be it preventing an adversary from using them or securing and eliminating dangerous weapons and materials in the wake of conflict or chaos. In addition, the United States will continue to face potential conflicts with rogue states hostile to U.S. interests and with states who may threaten our allies. And, as we have learned the hard way in Iraq and Afghanistan, if such a war involves regime change, it will require extensive post-conflict stabilization and reconstruction operations, likely of many years duration. Finally, the catastrophic devastation on the Gulf Coast reminds us of the critical roles the military has to play in responding to disasters here at home. This argues for making permanent the 30,000 person increase in active duty Army end strength that the Congress has authorized but that the Secretary of Defense views as only a temporary measure to facilitate the Army’s transition to a more modular force. Making this increase permanent would enable the Army to grow its active duty force structure to at least 48 brigade combat teams (rather than just 42) over time. Such an increase would reduce future strains on the Army given the projected range of future demand. While increasing the size of the Army would make it easier to meet future operational requirements, it will certainly not be easy. In the near term, recruiting additional soldiers will be difficult, if not impossible – at least until we turn the corner in Iraq. Building additional force structure will take time, both to establish new units and to populate them with trained personnel. Increasing force structure will also be expensive about $1.5 billion for each new brigade plus recurring personnel costs. Nevertheless, we believe that permanently increasing the active duty Army by at least 30,000 personnel should be pursued as a mid-term goal. Whether the active Army should be increased beyond this level will depend on a whole host of currently unknowable factors: the post-Iraq level of demand for U.S. forces, the extent to which efforts to rebalance the force are effective, the readiness and availability of Guard and reserve forces, recruiting trends post-Iraq, and whether the spiraling costs associated with military personnel can be brought under control. First, the U.S. military must convert units that are in low demand in the new security environment into unit types that are in high demand in order to reduce the most acute strains on the force. The Army is already planning to convert up to 100,000 personnel billets from low demand specialties like air defense and field artillery to high demand specialties like military police and civil affairs. Such conversions should be accelerated and their scope expanded as far as necessary. Second, we need to rebalance the mix of capabilities in the active and reserve components and create more stable and predictable schedules for deployment. Currently, there are a number of “high demand/low density” units in the reserve component that are being used almost as frequently as their active duty counterparts. More of these types of units need to be created in the active duty military.15 In addition, there are some types of forces that are almost always needed in the first 30 days of the military’s response to a crisis, yet many currently reside in the reserve component where they are more difficult to access in a timely manner. Secretary Rumsfeld is seeking to move these capabilities into the active force. This makes sense, but only to a point. It is imperative that our armed forces remain structured so as to preserve the essential link between the military and the body politic – to ensure that any President must mobilize substantial numbers of America’s “citizen soldiers” in order to go to war. Maintaining this link – and the accountability it brings – was the original intent of the Abrams Doctrine in creating the All Volunteer Force, and it should remain a fundamental design principle of the U.S. armed forces. What is most needed is a system of preparing, deploying, and resetting these forces that improves their availability to the nation while also enhancing predictability and stability for soldiers and their families. More broadly, the U.S. government needs to build deployable operational capacity in key civilian agencies like the State Department to conduct critical tasks for which the U.S. military does not have a comparative advantage. Such capacity should include a substantial cadre of full-time professionals who are deployable on a non-volunteer basis for rotations of at least a year, as well as a reserve of on-call experts from outside the U.S. government and substantial contracting authorities to access private sector capabilities. The U.S. also needs to encourage the development of greater international capacity to conduct complex missions like stabilization and reconstruction. In the absence of capable civilian partners in the field, the military is doomed to experience mission creep and no viable exit strategy, and the nation will be saddled with much higher risks and costs. Although President Bush has sent the U.S. military to war in Iraq and to fight terrorism around the globe, he has failed to mobilize the American people for either cause. There has been no John F. Kennedy-like “ask not what your country can do for you, but what you can do for your country” speech – no call to national service. This failure of leadership has only widened the gap between the U.S. service personnel and the American people they are risking their lives to protect. It has also left the military services bereft of the most important thing they need to be successful in recruiting young Americans to service and retaining those who have made an initial commitment to serve: civilian leadership with a compelling vision and strategy. This country needs a Commander in Chief who can use the U.S. military wisely and inspire a nation of young people to serve. America needs a President who, at a time of national need, will make a serious and sustained effort to call America’s young people to serve their country, be it in the military or in some other form of national service. In the meantime, Congress should continue to give the military services the flexibility they need to tailor and target recruiting and retention incentives to be as effective as possible. In recent years, Congress has acted to increase the bonuses and benefits that can be offered for both recruitment and retention. The 2006 National Defense Authorization Act includes an even wider variety of incentives, from higher cash bonuses to education benefits to down payment assistance for first homes to referral bonuses for serving soldiers who bring in new recruits. Additionally, we need to think more creatively about diversifying the range of contracts we offer to young Americans who are interested in serving their country. For starters, we need to make it easier for people to transition back and forth between active duty service and the Guard or reserves. We also need to make it easier for people who leave the military to come back into service and for “middle aged” Americans (30- and 40-somethings) to join the military if they meet all the necessary standards. The idea of making a life-long commitment to one organization is an anathema to today’s generation of young people. In order to make military service more attractive to them, we need to enhance the variety of experiences and opportunities it can offer them. We also note with concern the rift that has developed between many of our nation’s most elite universities and the U.S. military. In the Vietnam era, many campuses closed their doors to ROTC programs and military recruiters. Given the needs of the nation at this time in our history and the importance of having a military that reflects all sectors of American society, this rift should be healed. Finally, it would be a mistake to think that a draft can solve our personnel problems and provide the quality soldiers we need. However, we need to broaden our notion of national service beyond military service to take better advantage of two of our nation’s greatest strengths – cultural diversity and technological prowess. We need to find ways to bring Americans with critical skill sets, from language skills to computer skills, into national service of some kind, on a full or part time basis. 1 Some attribute this strain to the drawdown of U.S. military forces that occurred after the end of the Cold War. Overall, the number of divisions in the active duty Army has gone from 18 at the end of the Cold War to 10 today. Between 1988 and 1992, the first Bush administration reduced the active duty Army by 27% from 781,000 to 572,000. 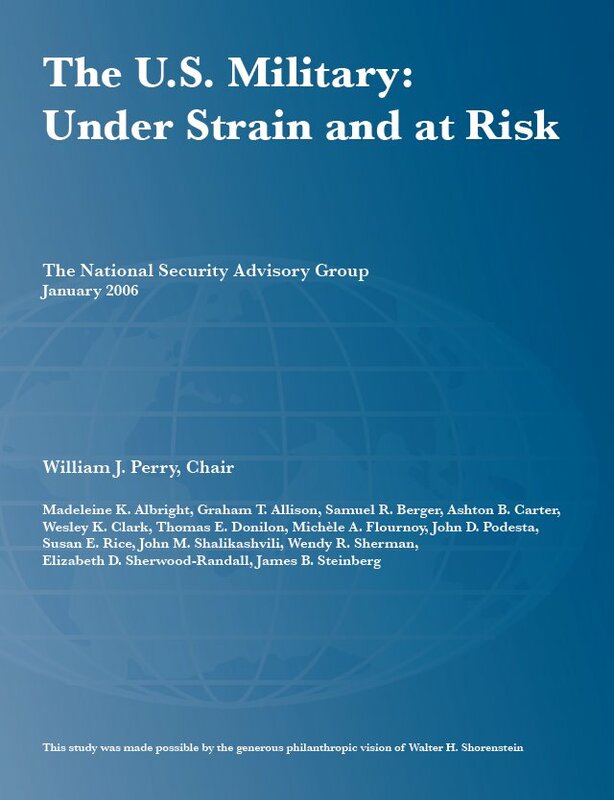 The Clinton administration reduced Army end strength by another 16% to 482,000 – a level endorsed by the George W. Bush administration in its 2001 Quadrennial Defense Review. 2Although this paper details some of the impacts of current U.S. force deployments, it does not take on the larger question of future U.S. strategy and force posture in Iraq. That critical topic is simply beyond the scope of this paper. 3 This includes 32 of the Army’s original 33 brigade combat teams; the exception is one brigade in Korea. In addition, 9 of the 10 new brigade combat teams being built as part of the Army’s transformation to 43 modular brigade combat teams are now deployed or scheduled for deployment. 4 Two brigades from the10th Mountain division are on their second tour in Afghanistan; the Army division and brigades that led the initial assault in 2003 are now returning to Iraq – i.e., units from the 3rd Infantry, 4th Infantry, and 101st Air Assault divisions. 5 The National Guard Bureau bases this calculation on 60% or more of a unit’s members having been mobilized for 18 or more consecutive months. 6 Under Partial Mobilization Authority (Title 10 of the U.S. Code 12302), following a declaration of a national emergency by the President or the Congress, the President may authorize the service secretaries to order units and individuals (not to exceed 1,000,000) on to active duty for not more than 24 consecutive months. This authority, invoked when President Bush declared a national emergency after 9/11, has been used to support OEF and OIF. Under Partial Selected Reserve Call-up Authority (10 USC 12304), anytime the President determines that there are insufficient people in the Active forces, he may call units and individuals (not to exceed 200,000) to active duty for not more than 270 days. PSRC was used in the first Gulf War and since then has been used primarily to support peace operations like the Balkans. Governors also have called Guard members to state active duty funded under Title 32 to support homeland security needs. Members of the Guard and Reserves who have already been mobilized for lengthy tours can, however, volunteer for additional deployments. 7 The goal of recruiting 80,000 troops a year in FY2005-2007 means that the Army must recruit an additional 10,000 troops per year (compared to FY2004). This 30,000 increase in active duty Army end strength over the next three years was requested as a temporary measure to facilitate the Army’s transition to a modular force of 43-48 modular brigade combat teams. 8 The Army estimates that 73% of American youth are not eligible for military service because they do not meet the military’s health, education, moral and other standards. 19 Some 9,800 soldiers are currently under “stop loss” orders, and the Army will likely continue stop loss for 7-9,000 soldiers through the end of FY2006 in an effort to maintain the integrity of deployed units. 10 It should be noted that Republicans lawmakers, who during the Clinton administration were quick to demand and hold hearings on the readiness of the armed forces every time a unit went to C-3 or C-4, have essentially looked the other way on force readiness issues during the Iraq war. 11 With stop loss, the end of FY2006 shortfall is projected to be about 20K. 12 These issues will be discussed in more detail in the NSAG II’s next paper on the budget. 13 See Section 1227 of the Conference Report of the Fiscal Year 2006 National Defense Authorization Act. 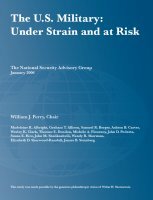 This section also requires the President to report to Congress on a number of factors, including the conditions that must be met to transition additional security responsibility to Iraqi security forces, the criteria used to evaluate progress toward meeting such conditions, a plan for meeting such conditions and an assessment of the extent to which they have been met. Iraq is indeed a critical issue, but a more fulsome treatment of Iraq strategy is beyond the scope of this paper. 14 The nature of this new social compact and its implications for the force management, compensation, benefits, etc. of those who serve in a more operational reserve is being explored in a CSIS study forthcoming in June 2006. 16 In a few exceptional cases, such as civil affairs battalions, there may be real limits on how far such rebalancing can be taken, as the skill sets required are more readily found in the civilian workforce than they are cultivated in a professional military context. 16 See GAO Report 05-798 available at http://www.gao.gov/new.items/d05798.pdf. 17 The NSAG would like to thank a number of individuals who made invaluable contributions to this paper, including: David Morrison, David McGinnis, and Shawn Brimley.